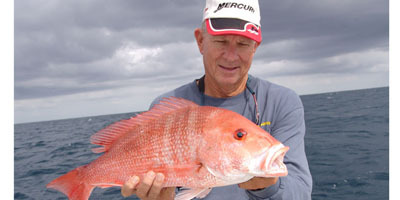 June 1 marks the much-anticipated opening of red snapper season in the Gulf of Mexico. Bold dispositions, feisty fighting ability and simply delicious filets make these ruby scaled delights a prized catch from Florida to Texas. On reefs, rock piles, wrecks and drilling rigs, red snapper are generally a straightforward species that responds aggressively to just about anything that looks edible. The complicated part is the regional regulations. In a nutshell, the National Marine Fisheries Service (aka NOAA Fisheries) manages red snapper in federal waters, while states have management authority inside their boundaries of 9 nautical miles from shore. A couple of the Gulf states have elected to implement red snapper seasons consistent with the general 34-day federal season of June 1-July 4, while others have taken different courses. This has resulted in state-specific seasons in federal waters. First, let's get the relevant background. With indications pointing to a growing Gulf red snapper population, NOAA Fisheries increased the 2013 Gulf quota from the 2012 level of 8.080 million pounds whole weight to 8.460 million pounds whole weight for 2013. The recreational sector gets 49 percent and the commercial fishing industry gets 51 percent. In February 2013, the Gulf of Mexico Fishery Management Council requested the National Marine Fisheries Service (NMFS) promulgate an emergency rule for the 2013 recreational red snapper season. This emergency rule was implemented on March 25, 2013, and allowed for implementation of state_specific closure authority of the federal exclusive economic zone off states not adopting consistent federal recreational red snapper regulations. NMFS completed a report (SERO 2013) on March 19, 2013, estimating the season lengths of each state in support of the emergency rulemaking. Previous estimates were based on Marine Recreational Fisheries Statistics Survey (MRFSS) landings data, as well as preliminary 2012 Southeast Head boat Survey and Texas Parks and Wildlife (TPWD) Creel Survey landings. The analysis also predicted catch rates in Florida and Louisiana state waters based on historical landings information. Federal fishery managers note that while the yearly quota for how many pounds of red snapper can be harvested has increased in recent years, the federal season length has gotten shorter over the past few years because of more fishing effort and larger fish. On the upside, the Gulf of Mexico Fishery Management Council will review the 2013 red snapper population assessment during their June meeting in Pensacola, Fla. The council may request an emergency rule to increase the quota again based on the new scientific information and request NOAA Fisheries to reopen the recreational season for red snapper later in the year. Mississippi and Alabama: Due to consistent regulations, the season will be 34 days and close on July 5, 2013, at 12:01 a.m., local time. Daily bag limit is two, with a 16-inch minimum total length. Texas: Due to inconsistent regulations, the season will be 17 days, and close on June 18, 2013, at 12:01 a.m., local time. Texas state waters are open all year for recreational red snapper fishing. Daily bag limit is four, with a 15-inch minimum total length. Louisiana: Due to inconsistent regulations, the season will be 24 days, and close on June 25, 2013, at 12:01 a.m., local time. Louisiana state waters are open weekends only (Friday, Saturday, Sunday), March 23-Sept. 30, 2013. Daily bag limit is three, with a 16-inch minimum total length. Florida: Due to inconsistent regulations, the season will be 26 days and close on June 27, 2013, at 12:01 a.m., local time. Florida state waters are open June 1-July 14, 2013. Daily bag limit is 2, with a 16-inch minimum total length. In federal waters, the daily red snapper limit is two and the minimum total length is 16 inches. Remember that state and federal regulations require all commercial and recreational fishermen to use circle hooks, venting tools and dehooking devices when fishing for any reef fish species in the Gulf of Mexico. For more on red snapper management, visit //sero.nmfs.noaa.gov/sustainable_fisheries/gulf_fisheries/red_snapper/.